The first round of the 2017 WSK Final Cup is gone. Alessio Lorandi (KZ2), Lorenzo Travisanutto (OK), Viktor Gustavsson (OKJ) and Nikita Bedrin (60 Mini) are the winners. 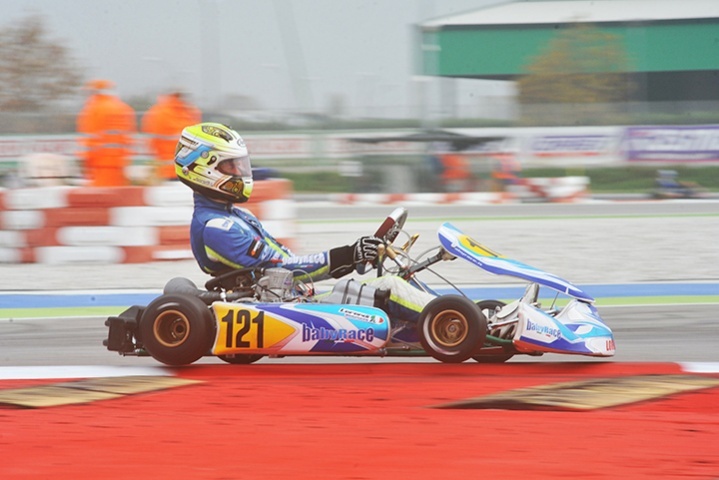 GP3 driver Alessio Lorandi (Tony Kart-Vortex) backs in karting and takes home a flag-to-flag win in wet conditions after an amazing weekend always on top. Behind his shoulders Francesco Iacovacci (Luxor-LKE) at the start loses the second position in favour of Daniel Vasile (DR-Modena Engines). The driver from Rome does his best to re-gain the runner up position, but his set up wasn't the best for that conditions. Lorenzo Travisanutto (Zanardi-Parilla) takes the head of the race immediately after the green light and pulls away to take the win ahead of Nicklas Nielsen (Tony Kart-Vortex) who is back in karting for this occasion. Third spot for another Tony Kart driver, the Spaniard David Vidales (Tony Kart-Vortex). Despite the wet conditions, Brits Jonny Edgar and Dexter Patterson (Exprit-TM) lose position after the start, while Russia's Alexey Brizhan (Tony Kart-Vortex) recovers from the back and takes the head of the race. The Baby Race driver holds the head for slightly more than half race, but he is forced to give the top spot to an amazing Viktor Gustavsson (Tony Kart-Vortex) who recovered from the sixth row on the grid. Luigi Coluccio (BirelART-TM) is protagonist of an amazing race: the Italian recovers 19 positions and finishes on the second step of the podium, while Brizhan is forced to settle for third. Russia's Nikita Bedrin (Tony Kart-TM) wins the final race at the end of a duel against the Italian Alfio Spina (CRG-TM), who spins befort the finishing line. Ruslan Fomin (Tony Kart-TM) places second, followed by Francesco Pulito (IP-TM).